In today’s fitness-oriented world, every protein product claims to be the best. So, what makes Dymatize’s ISO-100 any different? Here is a brief about Dymatize’s ISO-100.Dymatize is a 20-year old nutrition supplier that has grown to be one of the most reputed brands in the supplement industry. Aimed at producing safe and efficient products with the highest quality, Dymatize spans in more than 50 countries in the world. 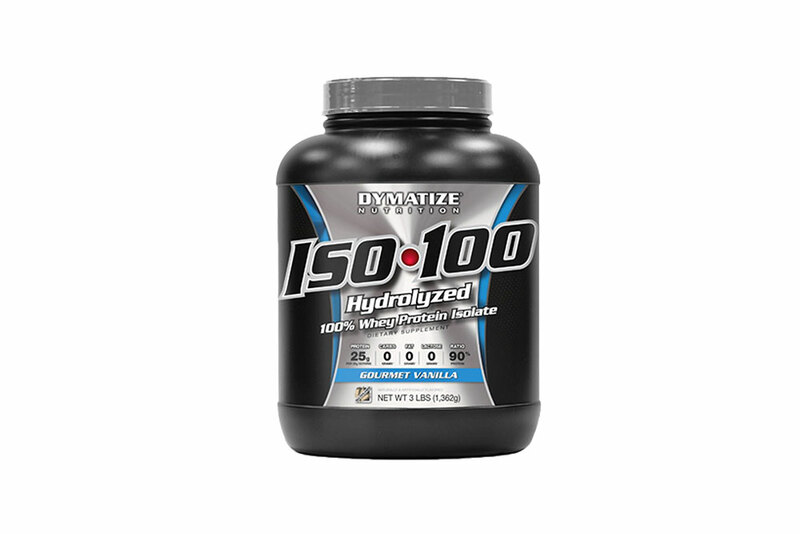 Dymatize’s ISO-100 contains 100% hydrolyzed whey isolates which, according to beliefs, digests faster than other isolates and concentrates. Normally, the whey protein powders are designed for sustained release. They consist of different types of proteins that break down in diverse orders and thus result in longer protein enhancement. But, the isolates of ISO-100 are contrasting to the common trends of the whey protein powders which means that they are absorbed faster but, might not last as long as the sustained released whey proteins. Dymatize’s ISO-100 protein powder is intended to be used as a food supplement to increase the nutritional intake of a diet. The whey protein present in the ISO-100 can be effective for eczema, prone allergies and allergic reactions, reducing weight loss in cases of HIV/AIDS, and reducing the symptoms of psoriasis. The pros of Dymatize’s ISO-100 are that it consists of 100% hydrolyzed whey protein which helps in enhancing the immune system of the body. The cons, however, include the fact that it is expensive, does not suit people who are lactose intolerant and lacks sustained release proteins. The intake of a protein powder is usually accompanied, and affected, by factors like diet, exercise, style of living etc. Therefore, it becomes quite difficult to decide whether the progress in the body is because of the powder or the complementary factors. The results of the various tests performed on protein powders can differ from powder to powder depending on the ingredients of the same. If we take a look at the ingredients of Dymatize ISO-100, there is no such ingredient that makes it special in the nutritional supplement industry. The sole purpose of ISO-100 is to provide protein to the body that may, otherwise, be absorbed in one’s regular diet. ISO-100 does not have any constituent that might help to heighten energy or testosterone levels in a body. Studies reveal that the whey proteins present in ISO-100 can be absorbed and processed by the body in a time frame of about 40 minutes, which means that the benefits of the whey proteins will only be available to the body for a few minutes and the unused protein will then be passed on by the body as waste. This will limit the benefits of the whey proteins unlike the sustained release proteins. The latter acts in a completely different manner and the body can enjoy its benefits for a longer time period. The muscles can take hours to recover after a workout. And the fast absorption of 100% hydrolyzed isolates is most likely to invalidate the effects. In some cases, the over-consumption of whey protein might also lead to side-effects such as loss of appetite, headache, swelling, cramps, fatigue, damage to kidney and liver, and developing allergic reactions. Apart from the science, the people who tried Dymatize ISO 100 liked the way it tasted—hiding the bitterness of hydrolyzed proteins. This protein supplement is available in smooth banana, pina colada, chocolate, vanilla, and cookies n’ cream flavors. 100% hydrolyzed whey protein isolate: used for enhancing athletic performance, and as a food supplement, it is a source of protein that might improve the nutritional content of a diet and result in a better immune system. Cocoa: cocoa powder, which is derived from the cocoa bean, is highly nutritious and is capable of providing numerous health benefits. Natural & artificial flavors: This helps in masking the bitter taste of hydrolyzed protein. Sodium chloride: commonly known as salt, sodium chloride helps in maintaining the fluid balance, relaxing muscles, and allows the nerves to transmit signals. Potassium chloride: This crystalline compound is used to treat and prevent potassium deficiency in a human body. Soybean oil: works to lower the cholesterol levels of the body. With all its pros and cons, Dymatize’s ISO-100 is a good protein supplement but it would have been a stronger contender if it contained portions of sustained released proteins along with hydrolyzed whey proteins. Specialists believe that 66% hydrolyzed whey proteins mixed with 33% of sustained release proteins make an appropriate protein supplement. All in all, Dymatize’s ISO-100 gets a C+ rating.